FUZHOU, Aug. 2 (Xinhua) -- The survival trail event of the International Army Games 2018 "Seaborne Assault" started Thursday in Quanzhou, east China's Fujian Province. Teams from five countries will compete in the two-day event. Iran, Russia, Venezuela, and China each have one platoon command and three marine squads in the event, while Sudan has one marine squad. Platoon commands consist of a platoon leader, sniper, and medic. Each marine squad consists of seven members, including a squad leader, driver, gunner, rocket launcher operator, and rifleman. The survival trail has been designed to test the requirements of actual combat. After finishing their combat missions, marine squads will rapidly withdraw from the battlefield and break through a blockade and enemy snipers. According to rules of the competition, marine squads must complete a four-kilometer armed rapid march along a designated route. They will pass through obstacles such as an inclined wall with ropes, anti-tank hedgehogs, barbed wire, lattice wall, skate, tires, and tunnels. After the obstacles, they will complete shooting tasks before carrying "wounded" team members to the finishing line. The ranking of the teams will be based on their final finishing time. 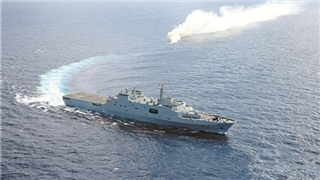 This is the first time the Seaborne Assault competition has been hosted by the People's Liberation Army (PLA) Navy. The competition consists of three events, a short obstacle course, survival trail, and relay race, and runs from July 30 to August 10.